Blue Line riders who board at the 38th Street and 46th Street stations may have noticed new green stickers featuring bicycle logos on platforms. 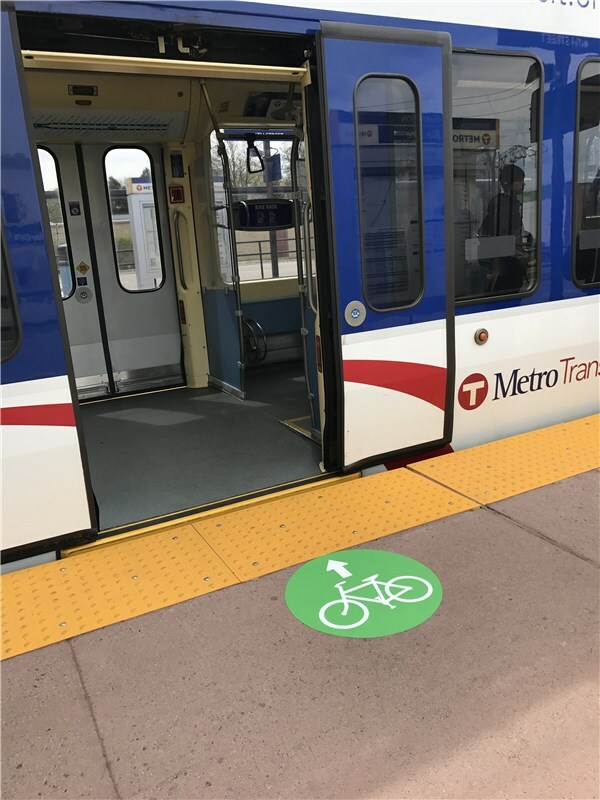 They appeared last week as part of a pilot program to help train riders traveling with a bicycle know which doors are closest to the on-car bike racks, said Kelci Stones, a specialist in Metro Transit's marketing department. The idea is to prevent conflict between customers boarding and disembarking from trains and eliminate guess work as to where to stand on the platform. "It will help everybody," Stones said. "It could be helpful for those traveling for the first time with a bike know where to stand." Metro Transit chose the two south Minneapolis stations to pilot the program because both stations are near popular bicycling trails and see higher numbers of bicyclists bringing their two-wheelers on trains than at other stations along the line. Stones estimates that about 15 percent of Blue Line trips carry at least one passenger traveling with a bicycle. From now through August, Metro Transit is conducting a survey to find out if the bike boarding indicators help cyclists find an onboard bike rack and if they might encourage riders to bike to transit. Based on feedback from riders, the program could be expanded to other stations along the Blue and Green lines. Stickers won't work in the winter because they will chip off, so Metro Transit would need to use spray paint or another "low cost" option to mark the spots if the pilot goes forward, Stones said.